NEWS: Don’t Starve Together: (Re)Forge! 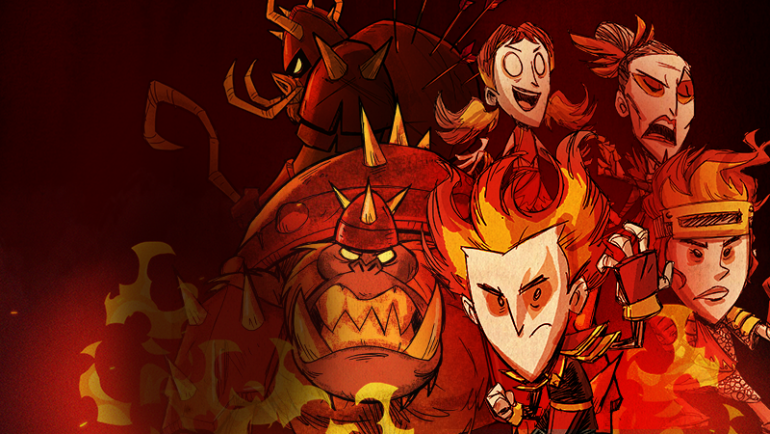 Home / NEWS: Don’t Starve Together: (Re)Forge! 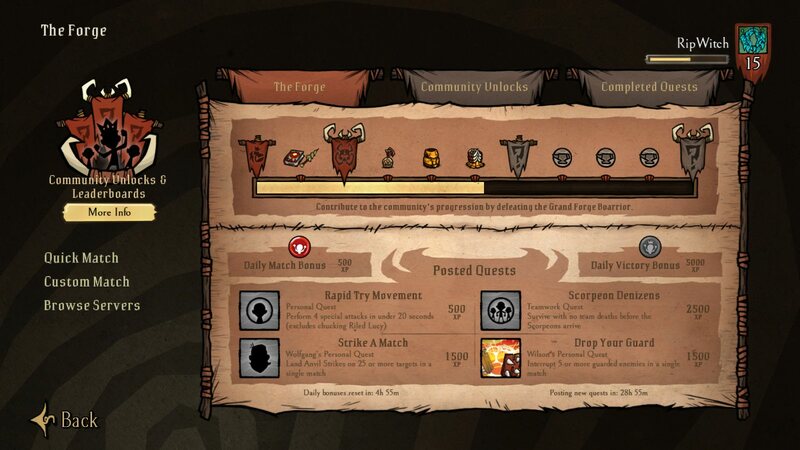 While Don’t Starve Together is revolved around, well, not starving with others some special events have mixed this up lately. Last year, The Forge brought a team of six into an arena to fight multiple rounds of enemies from the Battlemaster’s army or die trying; and earlier this year, The Gorge tasked a three person team to farm, gather, and cook dishes to appease the Eternal Gnaw’s hunger enough to avoid it’s curse and escape. With the next event still being planned, The Forge has made a return. Even though we got The Forge back, it looks like Klei put in some surprises for returning players. Instead of having the achievement system that you can work on all throughout the event, we have quests. Each day(-ish) you will get four quests – two of which will be character personal quests (ex. Land 10+ killing blows in a single match with Willow) and the other two will either be a teamwork or a regular personal quest – and completing them will give you extra XP. Most of the quests I’ve run into were similar from last year’s, but there have been new ones making their rounds. Along with new emotes, vignettes, profile icons and portraits, a new skin theme called The Magmatic has been added. You’ll get a chance at getting pieces of the Magmatic set, as well as last year’s Gladiator set when opening Pugna’s War Chest (which is rewarded when leveling up). The rest of the new additions lie in the enemies and items. The only enemy who got a new attack was the Boarilla. After taking a certain amount of damage, the Boarilla will now do a rolling attack. This will definitely make the runner’s job harder, since this threshold can easily be met and it’s hard to cancel it and seemingly impossible to dodge. Throwing Woody’s axe or doing the molten dart’s special can cancel it, but you must be quick and far enough away. I have heard you can dodge it, but haven’t had any luck myself. To lower the chance of Boarilla’s new attack to come in while kiting (or at least not having to deal with it as long), wait till the second punch to attack as you will usually lose aggro here. Each victory made in The Forge will contribute to the progress of unlocking new items and new bosses. Since the progress made in the Beta seemed to have carried over, The Forge offically started with what we had last year: The Grand Forge Boarrior, Tome of Beckoning, and the Spiral Spear. As of writing this, the community has unlocked the next three items that will presumably help with the new bosses: Hearthsfire Crystals, Steadfast Grand Armor, and Jagged Grand Armor. The Hearthsfire Crystals’ special ability is a bomb that will affect a small area, but otherwise it is a close range weapon (so it could be best to switch between darts and this especially when attacking Snortoises). The Steadfast Grand Armor gives 90% protection, adds 100 max health, and gives knockback resistance; while Jagged Grand Armor gives 80% protection, adds 50 max health, and gives 20% more physical damage. A new boss is close to being unlocked, but the new Forge profile icons suggests it will be a Rhinocebro and an Infernal Swineclops. Based on the flag sizes, these will most likely act just like the Boarilla and Boarrior waves. The Forge will be open till December 3rd, so play while you can! Who knows if Klei will open it up for the third time. Hallowed Nights, DST’s Halloween event, will still be going on till November 22nd.